"All chess players want to learn how to attack, but they don’t realize that the reason why their ELO isn’t 2200 yet is because of their poor defensive technique, not the attacking skills. The truth is, the ability to attack and to defend are equally important." All chess players want to learn how to attack, but they don’t realize that the reason why their ELO isn’t 2200 yet is because of their poor defensive technique, not the attacking skills. The truth is, the ability to attack and to defend are equally important. There are simply no strong players out there that only know how to attack and don’t know how to defend. No tournaments are won without a solid defense. Period. Majority of club players have trouble realizing that being attacked is a part of the game. It is not necessarily a bad thing. These players collapse under a minimum pressure because they are not trained to handle the defense correctly. If you are one of those players that have trouble playing solid defense, even against a tougher opponent, you should really think about working on this part of the game. Learning good practices of defensive play will save you many-many games, which you would’ve normally lost. Everyone knows, that the path for becoming a strong player lays not only through winning games, but most importantly through not losing. And that’s where a good defense comes into play. The question is how do you work on your defense? It is not tactics, not opening and not even the endgame. A different training approach is needed. That’s exactly why he brought together this comprehensive defensive video course. 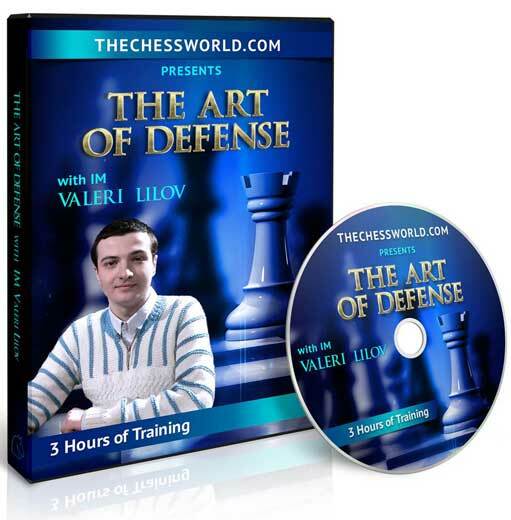 In this course IM Valeri Lilov shares some of the must-know defensive techniques in a clear and organized matter. IM Lilov goes through many different defense situations and explains how these positions should be handled. Simply applying the techniques demonstrated in this course will bring your defensive skills to a whole new level. What you previously considered “a devastating attack” would now appear as a “minor pressure”. Instant download of the 3 hour long video course covering the most important elements of defensive play with IM Valeri Lilov. The video covers 6 most important types of defensive techniques that every competitive chess player must know. 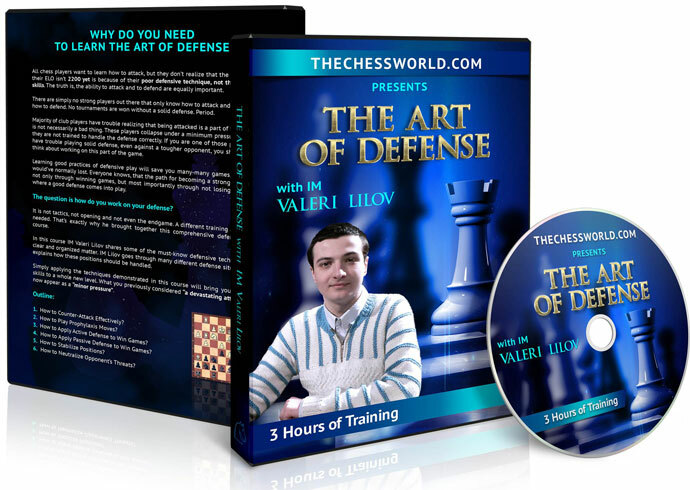 After finishing the art of defense video course, you will apply the concepts you have learned in the actual games. In order to reinforce the concepts you just learned we have specifically selected the examples from GM games that you can practice against our engine. Download PGNs of all examples covered in the video with extra lines, ideas and analysis by IM Valeri Lilov. 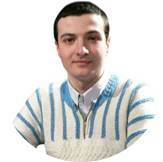 better known as Tiger Lilov, is a professional chess coach and lecturer renowned for his personalized approach to training students and professional players from all over the world. Having been an active tournament player all his life, he has won many international open tournaments and championships including the European Individual School Chess Championship U10 (Moscow, 2000) and the Kulaga Memorial International Open (Minsk, 2007). START WINNING WITH SOLID DEFENSE!